Children develop their muscles, their balance and their confidence while having fun jumping on the Nursery Trampoline from Galt Toys. 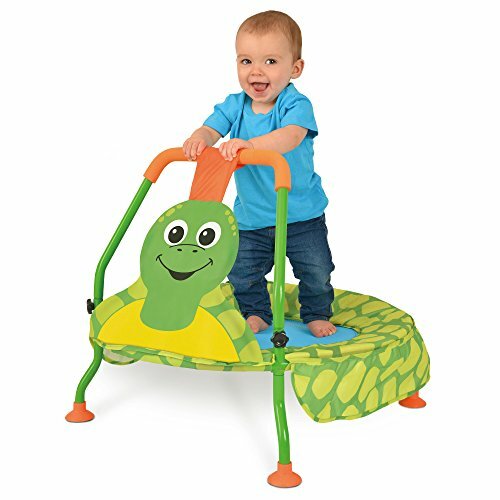 This bright green trampoline with its smiling tortoise face is safe for use indoors or out in the yard. The Nursery Trampoline features a padded cover and easy-grip handle perfectly suited for little hands. Rubber feet protect your floors and the tubular steel frame will stand up to plenty of enthusiastic jumping. For storage, simply detach the legs and handle. The Nursery Trampoline requires adult assembly and measures 27-1/2'' diameter and 23'' from floor to handle. Suitable for children 12 months and older who weigh 44 pounds or less. Perfect for children who are too young for Galt's classic Folding Trampoline (sold separately). Galt products are quality controlled and meet all American, Canadian, British and European standards for toy safety.